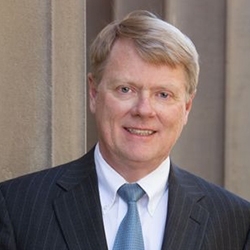 Rodney Parker is the President of SCM and leads the firm’s appellate practice. Rod’s practice focuses on civil and criminal appeals, family law and general litigation. Rod has handled more than 70 appeals in federal and state courts, including the U.S. Supreme Court, the Tenth Circuit Court of Appeals, the Utah Supreme Court, and the Utah Court of Appeals. He is a member of the Advisory Committee appointed by the Utah Supreme Court currently revising the State’s Rules of Appellate Procedure. In addition, Rod is a recognized resource on First Amendment cases that involve freedom of religion. Rod has represented the Fundamentalist Church of Jesus Christ of Latter-Day Saints in a number of challenges to the group’s beliefs and practices, including a challenge to the Utah bigamy law that went to the United States Supreme Court. In the wake of the 2008 YFZ Ranch raid, in which the court removed 462 children from the Ranch, Rod was the group’s media spokesman. His family law practice often involves custody disputes that encompass religious beliefs. He also uses his business finance background to advise clients in the area of divorce, especially in situations involving division of significant marital estates and business assets. Rod is experienced in all aspects of litigation — including discovery, motion practice, evidentiary hearings, trial, and appeal. He has litigated cases involving a wide range of general and business disputes, including products liability, professional liability, employment, ERISA, and patent disputes. He offers broad experience in computerized litigation support. Before joining the firm, Rod served as Associate Deputy Attorney General on the immediate staff of the Deputy Attorney General of the United States in Washington, D.C. In that position, he exercised the DAG’s oversight function for the Lands and Natural Resources Division and the Civil Division. Rod is a member of our Appellate Practice Group, which assists clients with appealing civil and criminal matters. The Appellate Practice Group also prepares an Appellate Highlights article for the Utah Bar Journal. This article, which is published six times a year, highlights notable cases decided by the Utah Supreme Court, Utah Court of Appeals, and Tenth Circuit. I’ve always liked the technical side of things. At work, I like to fix my clients legal problems. Outside the office, I also like to fix things – especially classic cars including Corvettes and Mustangs. I make improvements around the house and at my cabin where I also enjoy star gazing with my collection of telescopes.